It has been a chilly week so far here in west Michigan. Cold, rainy, and windy. The kind of weather that makes you want to curl up with a book and a warm mug. If you follow FYB on Facebook, you may have noticed about a month ago that I posted a photo of a homemade golden latte and a recipe from Wellness Mama. I have been loving this creamy, spicy, soul-warming drink for the last several weeks. I think I’ve made it differently every time, but I must credit the inspiration for today’s post to that original recipe. After discovering fresh turmeric at my regular grocery store, I started day-dreaming about making a fresh turmeric milk. Like fresh fresh. From scratch fresh. So fresh that the very milk is infused with turmeric and ginger. So that upon drinking it, you, my friend, are infused with the deliciousness, and health-boosting benefits, of ginger and turmeric. This milk is alive and kicking! It will make you feel the same. Also, did I mention it’s fresh? So fresh. 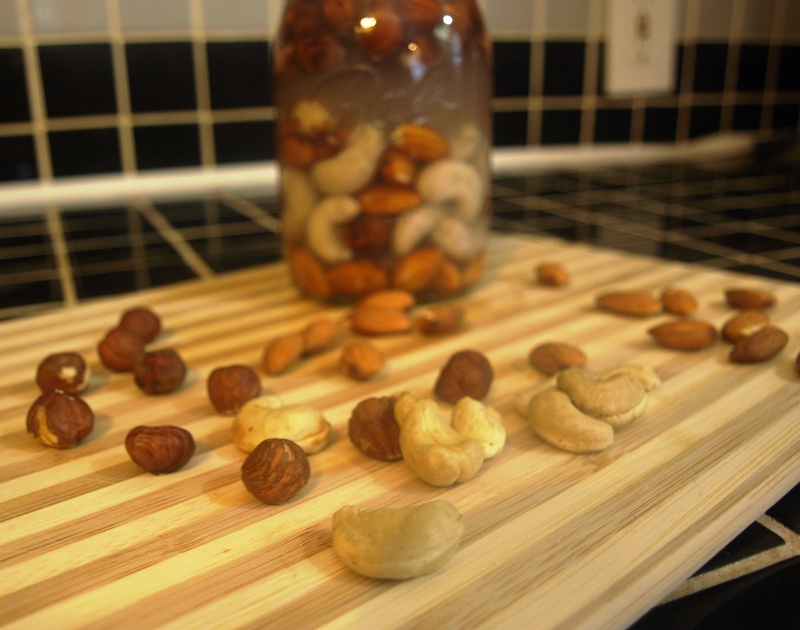 Any combination of raw nuts or nuts and unsweetened shredded coconut will work. Or even fresh coconut meat if you really want to get fancy. I used a combination of soaked raw almonds and cashews and unsweetened shredded coconut, for the creamiest, dreamiest milk. Then I blended it up with medjool dates, a big ol’ chunk of fresh turmeric and ginger, some Ceylon cinnamon, and a peppercorn or two (for optimal curcumin absorption). Strain it, gently warm it, and sip. Ahhhh. It’s a beautiful thing. Although I like the convenience of store-bought almond milk, I love making and using homemade nut/seed milk, because it is just so simple and creamy, with no additives, gums, or sweeteners. It really makes this turmeric “latte” even tastier, creamier, and yes, fresher. I’m pretty much in love with this spicy, warm, creamy, healthy treat, and I want you to be too. It’s so tasty, I won’t even go into how good it is for you. It is basically chock-full of anti-inflammatory properties, which, as you may have noticed, I’m rather obsessed with interested in lately. Place coconut shreds in blender. Add 1 cup of hot water and allow to soften for 5 minutes. Then add another cup of water, nuts, and the rest of the ingredients. The amount of turmeric and ginger you use is up to you. I use a fairly sizeable amount of both now, but maybe start with a 1 inch chunk of both. You can always add more. Blend for about 1 minute, then strain through a fine mesh strainer or nut milk bag into a glass jar. Taste and add more turmeric, ginger, or cinnamon, blending again. Can be enjoyed gently warmed or cold. Thank you! I swear we have such similar tastes in all things yummy! I’m so excited to inspire you to make some again! Its been so cold and dreary around here, and this drink is so bright and cheerful, not to mention deeelicious! I’ve been meaning to make my own almond milk and try turmeric milk, so maybe this will be the inspiration I need. We make something similar back in India to soothe a bad cough (although we add a few spices in it)… And it works like a charm!! Haha sounds like it would do the trick! I am intrigued by your hot and spicy version! I have found that even this mild drink has made me feel better when I feel a bug coming on. Turmeric and ginger.. Magic! Amazing! Thank you so much for sharing this 🙂 and yes it is nice to have your mom take care of you when you’re sick! Though I’m afraid those days have passed for me, now I’m the mama 😉 I will definitely be giving your family’s remedy a try next time one of us gets a sore throat/cough!